This is one instance where you just had to be lucky... I had my camera in my lap and the sunroof open! Great capture. Always keep that camera handy. What a great action shot!! Don't you just love it when things come together :-) I really enjoyed this photo, Great Job!! What a wonderful action photograph. Thanks Talsi.. Do you recognize where it was taken? Cade's Cove.. not sparks lane but the other one. My hubby was driving and the buck crossed in front of us, I had already shot a ton of deer that day and wasn't interested in shooting another. 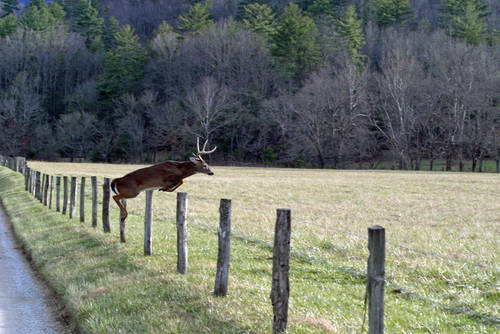 We watched him try to go under the fence but his horns wouldn't fit, then I realized oh snap.. he's going to jump. I shot this out of the sunroof of my SUV!